This is a lesson (mostly for myself) in doing my pattern math properly, and not just winging it. I’m working on this shawl – the body of the shawl is a simple but beautiful stitch pattern with increases every right side row. The pattern* says to knit the chart repeat 12 times total. At 6 increases per right side row and 6 right side rows per chart repeat that equals 432 stitches increased (467 stitches total, in case you care). Somewhere around 395 stitches I got tired of counting pattern repeats. So I counted all my stitches, subtracted from the final number, divided by 6, and noted how many more increase rows I needed. Now I could just keep track of each right side row with a simple hatch mark on the pattern (we’ve all done this, right? It’s like counting the number of increases in a sleeve rather than counting all the stitches) I figured I needed nine more increase rows. This is where I loose track. I don’t know what happened, but when I counted I didn’t get 461 stitches, I got something less than 400. I double checked my counting. I counted from the other edge of the needle (as if that would help) But I seemed to be getting the same number every time. So then I complained LOUDLY about screwing up my math the first time. I complained about having another 13 increase rows before I could start my edging. Yes, according to my car math I needed another 78 stitches. This would actually have put me at FEWER stitches than I had after my first count. You’d think maybe some red flags would’ve been raised? I mean, we’ve all had black hole knitting experiences – where you knitandknitandknit and don’t seem to make any progress, but this is just crazy. 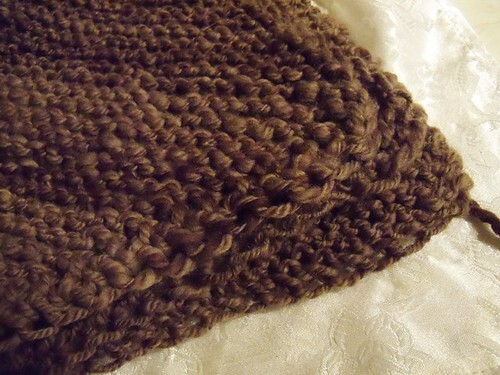 Somehow I convinced myself that working 8 increase rows had given me fewer stitches than I had before. I might’ve caught this mistake sooner, except I was snowed in with friends on Saturday. So I spent the whole day chatting and knitting and not paying attention. By the end of Saturday I’d finished 12 of the 13 additional increases. Then I thought, maybe I should count my stitches again. And you know what the worst part is? The pattern is correct. If I’d just kept track of the chart repeats like the designer (that’s me) told me to I wouldn’t have this problem. I’d have sailed through the body and by now I’d be 18 rows into the edging. But I had to second guess the designer (yeah, still me) and try and come up with a better way of counting things. And then I let car math sway my judgement even further. The lessons: Just follow the pattern. And don’t make big decisions based on math you do in the car. 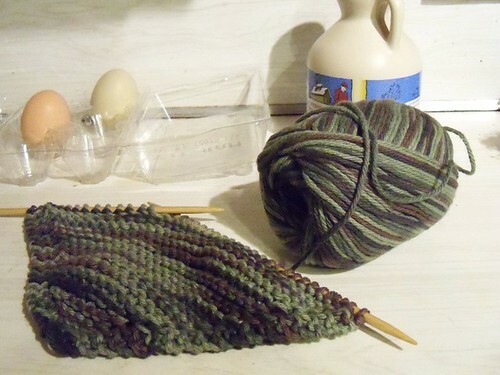 *yes, it’s my pattern, but the point of writing the directions out first is so I don’t have to think while I knit. **yoga is in a loud and stinky gym until our teacher finishes building her studio. I’m convinced that waiting in the car is part of why my math got all thrown off. I’ve been complaining about the lack of true winter weather pretty much since the season started. Last weekend mother nature finally came through. The storm got started a day later than predicted. but once it got going it snowed and snowed and snowed. I had friends come visit for the weekend, and instead of venturing out to explore Vermont we spent pretty much all of saturday snowed in. We knit, the guys brewed beer, and we all watched it snow. 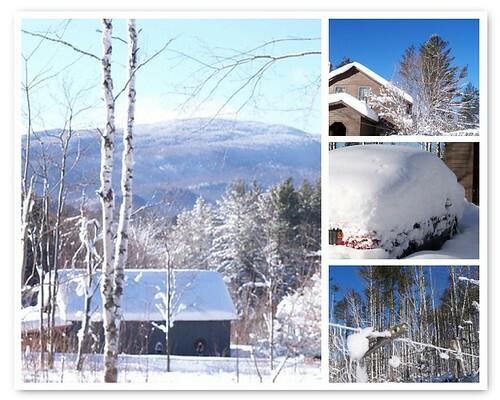 Since we live on the side of the mountain ridge that faces west we got LOTS of snow – 24 inches in my front yard all* from one storm! The valleys only got a foot of snow, and burlington has less than 6 inches. There’s a technical term for this – Orthographic lift. Basically as the air mass moves over a mountain it’s SQUEEZED through the tight space between the top of the mountain and the top of the atmosphere. And the squeezing presses out the extra moisture. In winter this means snow over the mountains, and lots of it! One of the many reason I love living where I do. *all of it. The weekend before the chickens had been scratching in the brown grass of my front yard. 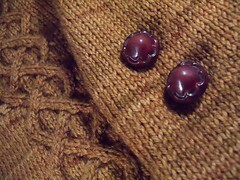 As I mentioned, I’m one sleeve, a collar, and button band away from being finished with my Boyden cardi. Usually at this point I’ve already picked out buttons* or at least I know exactly what I’m looking for in a set of buttons. But not this time. 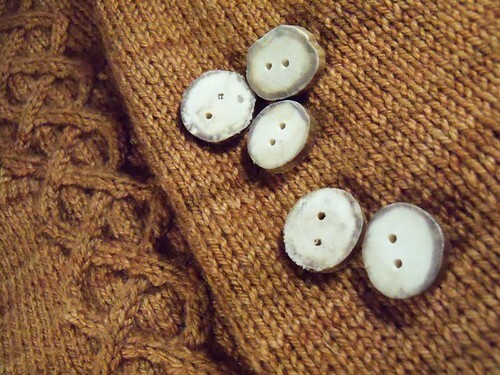 For this sweater I have no idea what kind of buttons I want. 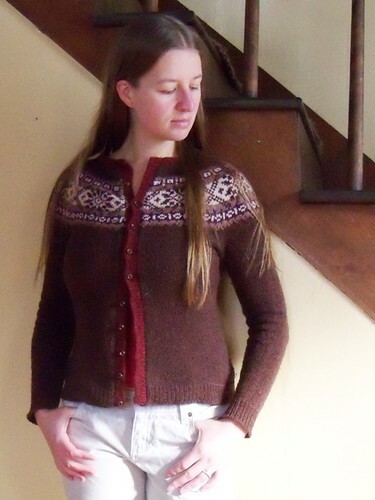 And buttons can really make a sweater pop – like the orange ones on the blue Evendim from Twist Collective, or the row of tiny little buttons on Iolanthe. So I’m looking for suggestions! I’m pretty sure I want medium sized buttons, something around 3/4 to 1 inch. I don’t want high contrast, but I don’t even know if I want them colored, brown, white? Or what material: pewter, clay, plastic, glass?? I think I need at least 5, but 7 would be better, and even 9 might not be bad. The next ones are the right size and I have 7! But what you can’t see in this photo is that the gold swirl on them is a bit too shiny. 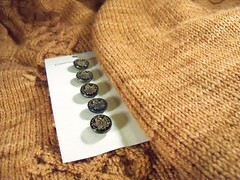 And while I really like the leaf imprint buttons they’re only half an inch which I’m afraid is too small. It might be ok if I had 9, but I only have these 5. 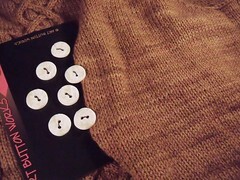 So all that remains in my stash are these horn buttons. They’re a good size, and I like the color. But I’m still not sure if 5 buttons is enough. Do you put this kind of thought into buttons? Where do you like to find them? Got any good online sources you can recommend? Which is a full square now. This might seem pretty good, until you learn that two days ago it had 16 rounds of edging. 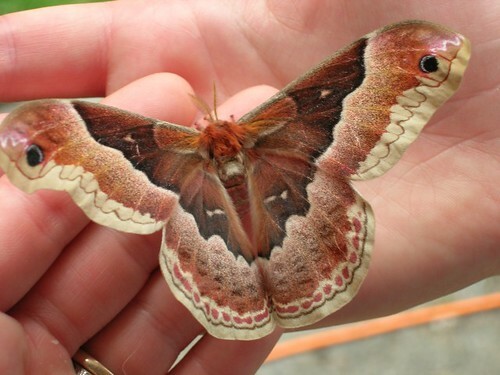 But the lace pattern I’d made up was pulling in too much along the edges. It took me so many rounds to realize my problem because I thought that the circular needle was pulling in the edges: until I took it off the needle and still couldn’t spread the thing out. So now the blanket is in time out until I figure out how to work the edging. My boyden cardi was going really well! Until I finished a sleeve (I shouldn’t complain!) Now I need to do more charts before I can knit the second sleeve. I also really need to add the body edits to the electronic file before I forget them. So – with all these projects in various stages of holding I was a bit at a loss trying to decide what to knit in front of the TV last night. I had a bit of baking inspiration this weekend! 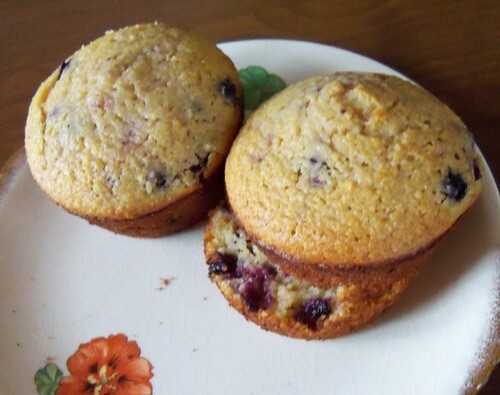 After briefly consulting my standby recipe book* for important things like how-much-baking-powder-to-use-if-citrus-is-involved I created a muffin recipe of my very own! Grease 12 standard muffin tins (or line with papers) and preheat oven to 400F. In a large bowl combine all dry ingredients and mix thoroughly. In a small bowl whisk together milk, eggs, and oil. Add lemon juice, whisk briefly and fold into dry ingredients. Note that if you mix the milk, eggs, and oil well enough the milk will not curdle when the lemon juice is added. But I wouldn’t push your luck by letting it stand around for awhile or anything. 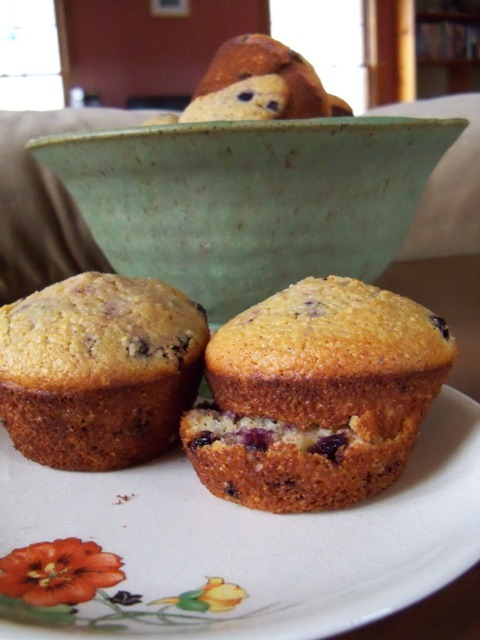 When dry and wet ingredients are almost all mixed add the blueberries and mix. 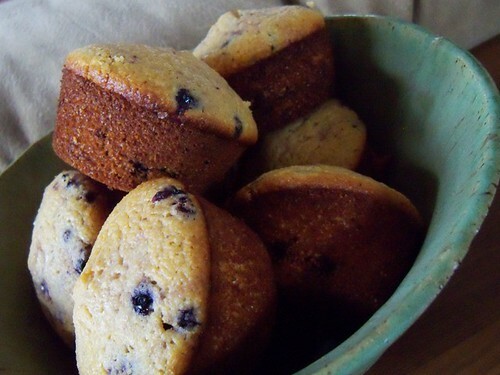 Spoon the batter into the muffin tins until they are almost, but not quite, full. Good luck letting them cool before you start eating them! The other day the lid on my yogurt container cracked. Not wanting the plain yogurt to absorb lots of funny refrigerator smells I needed to transfer it to some other container. I figured while I was at it I could divide it up into smaller containers so it’d be easy to grab one for breakfast or a snack. I added the granola as an experiment. 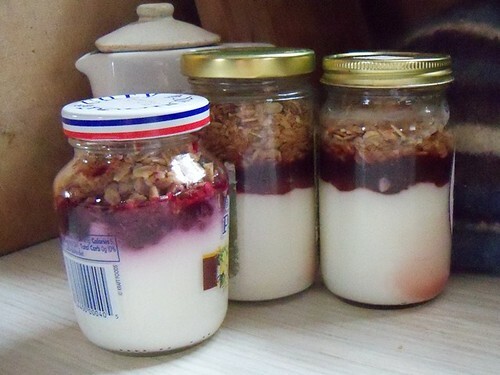 I was hoping the jam would separate the yogurt and keep it from getting too soft. It sort of worked. 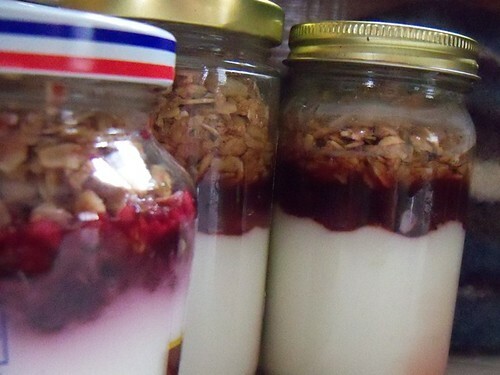 The granola got a bit softer than normal, but still added texture and didn’t go completely mushy. I’m always on the lookout for quick and easy food ideas that aren’t commercially made (in the “eat only food your grandparents would recognize theme) So when I came up with a great idea of my own** I figured I’d share it. 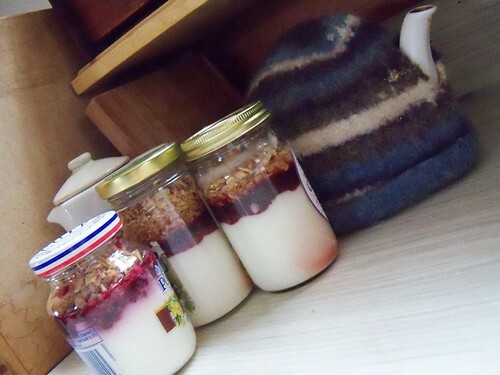 *I have a lot of jam leftover from last summer that needs to be eaten before I start making more next summer! **Not that I’m the first person ever to do this, just that I haven’t seen anyone else talking about it. Once the steeking was done there wasn’t much left. 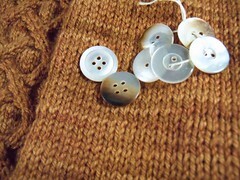 I grafted the underarms, wove in the ends, and attached 11 little brown buttons. 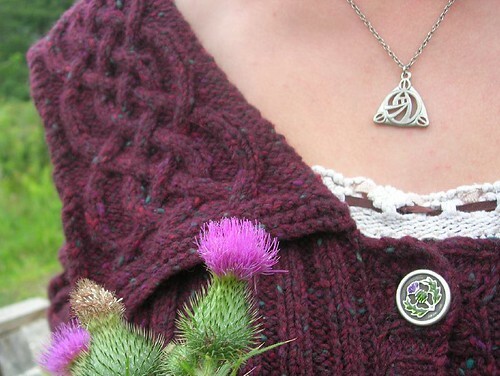 I definitely recommend Plum Frost if you’re looking to try a little colorwork. 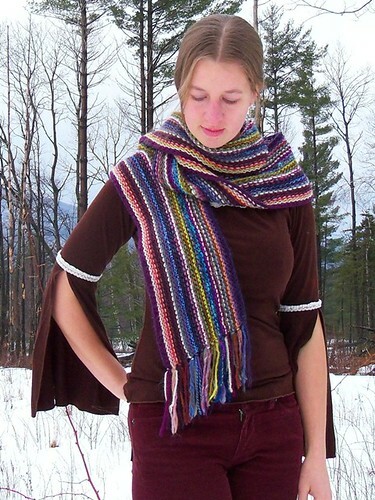 And if you don’t want to cut up your knitting the pattern includes pullover directions too. Now I have another finished cardigan. 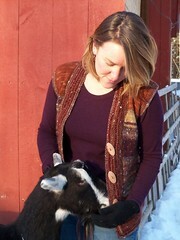 I admit I’m loving my cardigans more than my pullovers in this weird, warm winter that Vermont is experiencing. 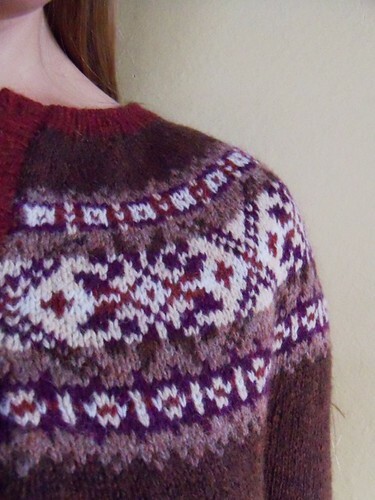 I love the warm brown shetland wool of this sweater, the pretty red and purple in the colorwork. 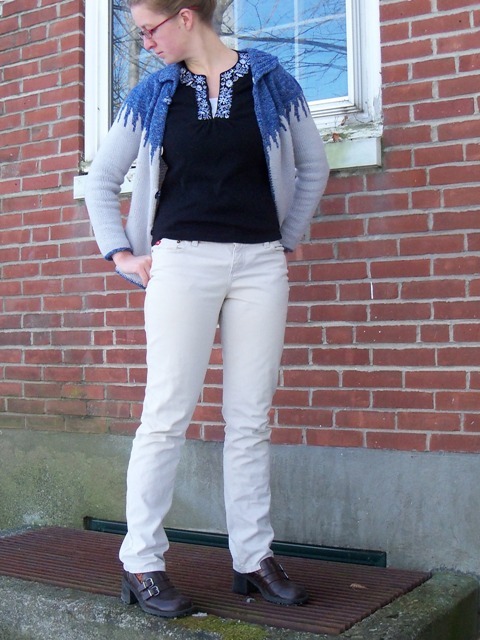 It’s a great cardigan, lighter weight than many of my other sweaters. It was perfect for strolling around outside while I was in South Carolina for training last week. 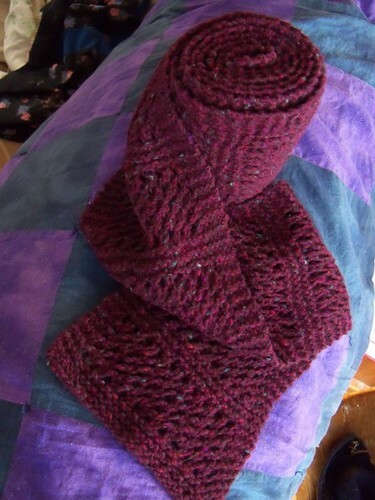 While I was traveling I also finished my first scarf for the HRBP cancer research fundraiser*. *It’s certainly not too late to knit a scarf if you still want to get involved! So I wrote up a little pattern! And I’m making it available to everyone for free. 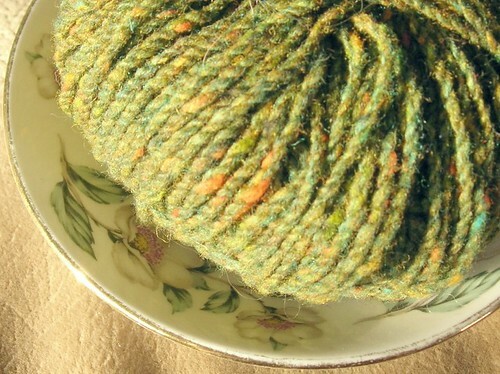 You can favorite and queue it on Ravelry as always. As I mentioned before, it’s wicked easy. But this PDF includes a diagram for the overhand knots I used to trim the fringe. I also included a half page of suggestions for choosing and organizing colors so your scrap scarf can look something like mine. 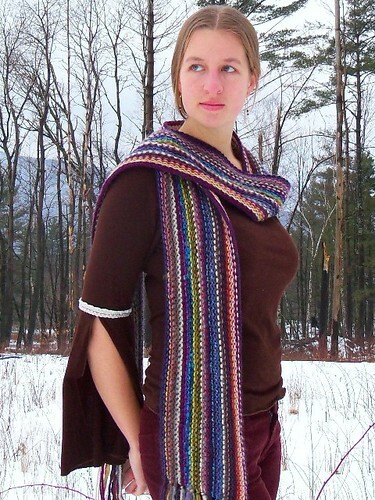 I’d like to thank Ravelry for making this free download available to members and non-members alike! But of course it won’t look much like mine, because the wonderful thing about these scarves is that each one is unique! Last fall Neil and I got a 40lb box of onions. We’d never bought bulk onions before, but they’re so tasty we figured – why not! Well as February rolled around the early bloomers* of the box have started to sprout. 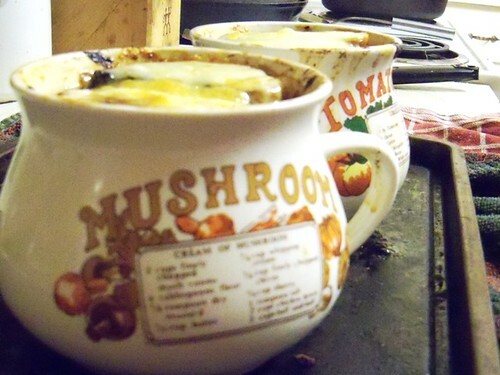 On Saturday Neil made french onion soup (and we could make it a few more times before putting a decent dent in our onion supply!) I don’t know where Neil found his recipe but it took HOURS. The chopped onions were roasted in the oven for 3 hours before moving them to the stovetop. Then there were FIVE rounds of deglazing the pan (the last time with sherry.) Then came the usual soup steps of adding the broth and simmering things. It took Neil all afternoon**, but the results were AMAZING. We still make a point of cooking a nice dinner for each other on valentine’s day. We’ll make a special dish, something that takes a little extra effort. There will be candles, and dessert once dinner is finished. We’re not the sort of people who buy into a commercialized version of any holidays. So this is a great way for us to celebrate our relationship without going all commercial. **he made a baguette from scratch too, for the topping.